"If your computer doesn't work, and you want to copy iPod music playlist to another computer. It is so pity the iTunes just can manage the iPod playlist but you can not copy all iPod playlist to computer hard drivers. So now a third-party program named 3herosoft iPod to Computer Transfer can help you out of this trouble completely. It can not only copy iPod playlist to computer, and even sync all iPod playlist to iTunes library." How to copy iPod playlist to computer and sync to iTunes? Free download and run the software. 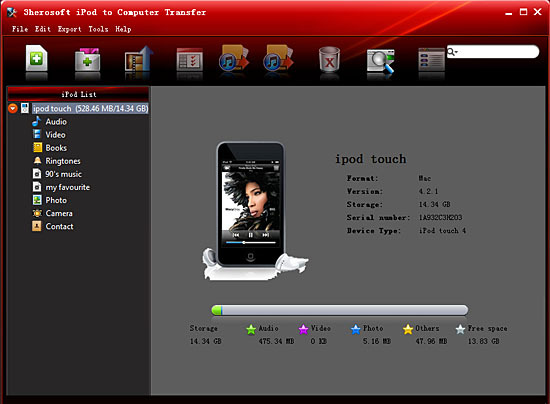 Connect your iPod to computer , you will see all information about your iPod device, such as Type, Capacity, Version, Serial Number, and Format, will be shown on the main interface. And the iPod library folders are displayed in the iPod list. You can also buy this iPod music transfer and get the full version. 1) Click "Playlist" icon in the iPod list to open iPod playlist folder and check the music files in it. Make sure music files in the music playlist are without any loss. Even you can select any music files in the certain music playlist. 2) Turn to the top toolbar, press "Export playlist to local" button to start to copy iPod playlist to computer. You will see the copying progress in the pop-up window. Before you export, select a target folder to save the iPod playlist files on your computer hard driver. 1) All iPod playlist in iPod library, and sync them into iTunes library will be best choice for managing iPod playlist. Check the iPod playlists including all music files, and press "Export playlist to iTunes" button to start to sync iPod playlists to iTunes library. Several minutes later, all iPod playlist are transferred into iTunes libary. 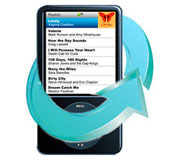 2) When the process is over, close the 3herosoft iPod to Computer Transfer software and run the iTunes to check the playlist. Open iTunes, and you will see the sync process in the top, few minutes later, all iPod playlist will be shown in the iTunes list.